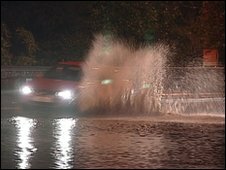 Motorists had to be rescued from their vehicles after torrential rain caused flooding in Devon on Saturday evening. Firefighters rescued three people from a car trapped in floodwater in Plymouth, and another person from a vehicle in Alston Cross, Ashburton. Water reached about 4ft (1.21m) high in Station Road, Exton, near Exeter, as firefighters were called to a series of flash floods affecting homes. More bursts of torrential rain are forecast on Sunday. One driver had to climb up on to the roof of his van after it became trapped in more than 3ft (0.91m) of floodwater in Venton, Sparkwell. The basements of four properties in Mutley, near Plymouth, were flooded along with houses in Elburton, near Plymstock, and Ivybridge. Strong winds brought down an electricity pole in Millbrook in south-east Cornwall on Sunday morning. A canoeist was found safe and well after his empty boat was spotted in the River Tavy at Tavistock on Sunday. Specially-trained fire crews were called in to search the river this lunchtime. The Met Office issued a severe weather warning for South West England on Sunday.